The Straight Dope: Is 30 Minutes of Exercise Better Than An Hour? A strong hormonal response (triggered by glycogen-sucking anaerobic work) is what you want in order to make the quickest adaptations to your body. You always get one at the beginning of a workout but it's harder to induce them once you’re warm and moving easily. 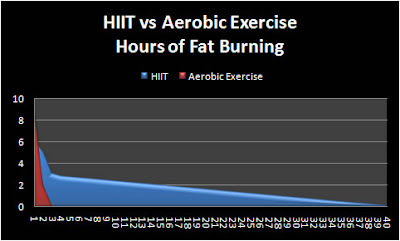 However, high-level athletic training reverses this so the most important period becomes the push you make towards the end of the workout when you are tired, which can create an even greater hormonal response provided that you are fit enough to handle the workload. So, while short exercise is better than longer exercise by some measurements, there are also times, especially in conditioned populations, where the end of longer exercise is what matters most. any excuse to post the 'torture test' works for me. Says a lot for it. There have been quite a few studies specifically about the effects of 10 minutes of exercise using various levels of intensity. One was released earlier this year and they go back--all showing excellent results--to the 80s. If you remember Kirk Douglas looking all ripped when he was old back then he attributed his gains to a scientific "breakthrough" on the effects of short high intensity exercise and claimed that he never trained longer than 10-15 minutes. In the 90s a lot of NFL teams adopted "first set only" approaches to in-season maintenance work when studies showed you could take away 80% effectiveness of a workout with one set. "The issue becomes how some people interpret this." Isn't that the point of this article? It's what it seemed like to me.